You can already follow THINKING-BIG's videos on YouTube, channel ThinkingBigEA. May 2015 - TED talk at TEDx Vila Real "Finding positive psychology in my life stories"
Conference presented in the TEDx event in Vila Real, Portugal. The power point presentation showed during the conference can be seen here. March 2015 - Conference on the launch of the 2nd edition of "Pontes para o Futuro"
Conference on the launch of the 2nd edition of "Pontes para o Futuro", a project from Porto City Council that aims to put in contact organizations and institutions of Porto's social network with entrepreneurs and citizens of the city, so that together they can find creative solutions to the existing problems. The contents of the conference can be found here. A warm-up activity developed at Creative Mornings Porto. December 2014 - Video of the conference on "Questioning the Obvious in the creation of a company"
Conference presented at Entrepreneurship Fair, in Oporto, about "Questioning the obvious in the creation of a company". Video directed by Catarina David. Celebrating 3 years of THINKING-BIG. The project in images, in a video created by Rita Pureza while in her stage year at the Research Department of THINKING-BIG. Presenting as co-mentor in Master Spitch 2013, from Cidade das Profissões. A short video explaining the essence of the classes about Expressive Body Work developed by THINKING-BIG. A full length video of the conference "5 ways in which a day taught me how to think big", at FNAC, Marshopping, Porto, Portugal. Held in the middle of FNAC, an open conference allowing attendees to listen and share their opnions and thoughts, in a relaxed and comfortable atmosphere. During the Entrepreneurship Fair, in Oporto, RTP1 interviewed THINKING-BIG, as one of the projects representing new ideas in Portugal. Interview for the blog #humanmarketing, focused on the importance of the human factor for the business world. 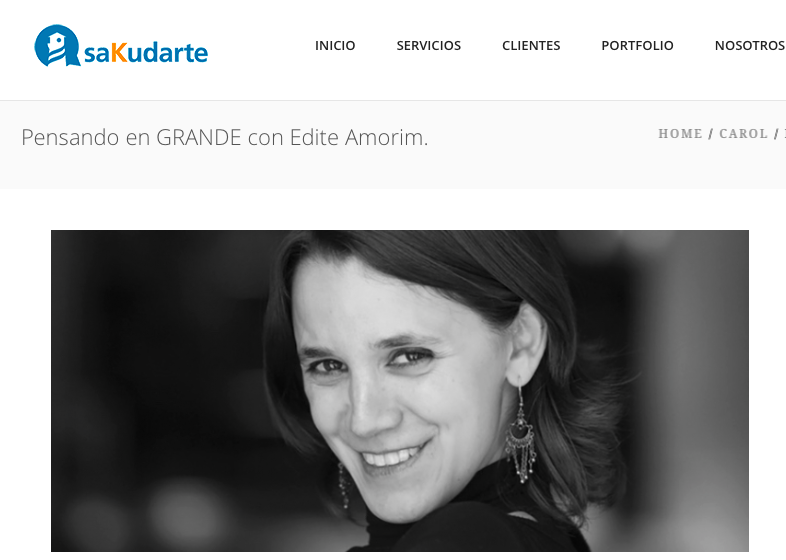 ​Blog belonging to Sakudarte, an online marketing agency from Valencia, Spain. Interview for CreativeRoom4Talk, an online Serbian magazine dedicated to Creative personalities from all over the world. Interview for FALAR CRIATIVO, with Rui Branco. Sharing opinions about Creativity, Positive Psychology and life adventures. An informal interview, by Sandra Burgos about life perspectives. 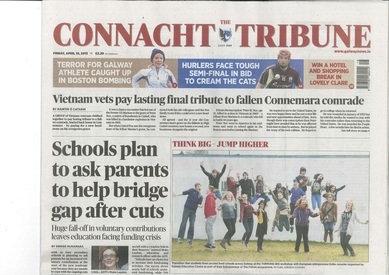 Working with students from the transition year about entrepreneurship. Soulsight, a Design-Thinking company from Madrid, has published an interview with Edite Amorim about Creativity and Positivity on its Soultalks, June 2012. A great opportunity to connect with the underlying themes of THINKING-BIG: Creativity and Positive Psychology. BIZ MIX, a Portuguese training, business and innovation magazine interviewed Edite Amorim from THINKING-BIG. 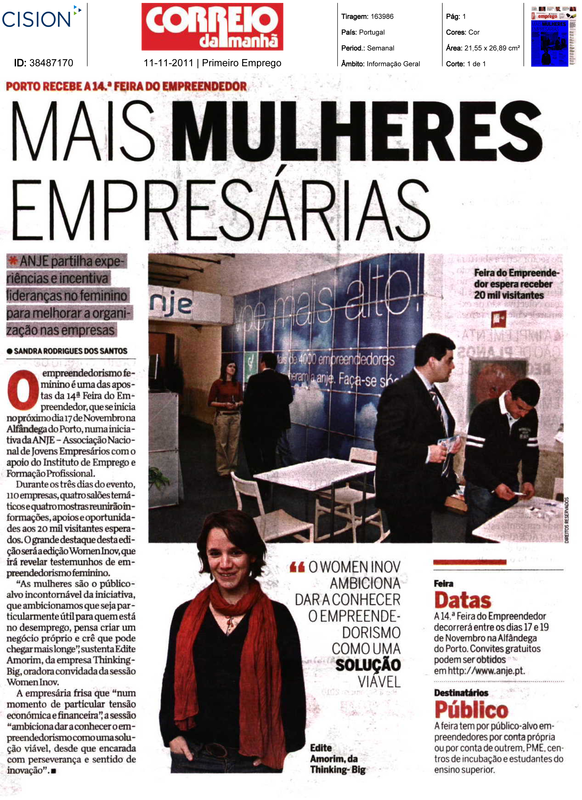 The magazine, reaching up to 200.000 Portuguese companies, dedicates its January issue to creativity and women. And this is where THINKING-BIG comes into play. Read the article here. November 2011 - THINKING-BIG - Entrepreneurship by women. Correio da Manhã, portuguese national newspaper. Read the news here. Comércio da Póvoa, portuguese local newspaper. Read the news here. Interview for the Radio ONDA CERO PONTEVEDRA, with Susana Pedreira and Javier Arnau. Talking about travels, thinking big and life perspectives. 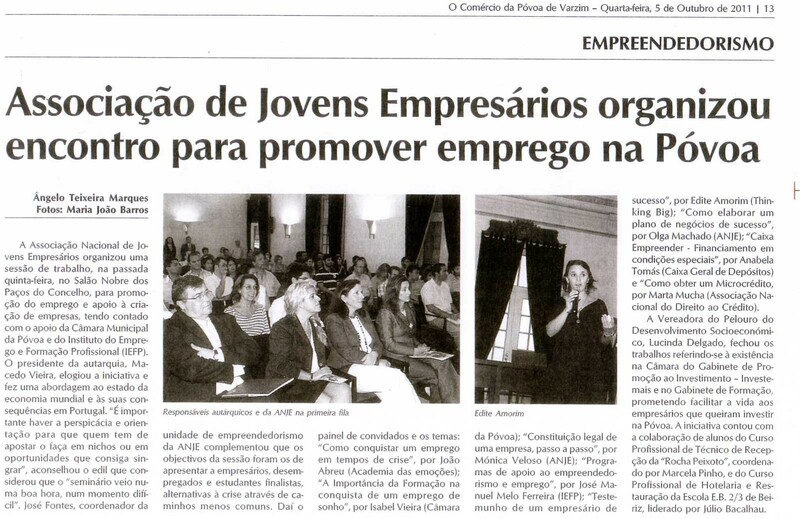 An interview about the Entrepreneurship Fair and the Women Inov initiative, with Hugo Costa, from ANJE (National Association for Young Entrepreneurs) and Edite Amorim, from THINKING-BIG. Program "Portugal em Directo" (Portugal life).